Paula Ann Nunn died aged 68 from mesothelioma in September. 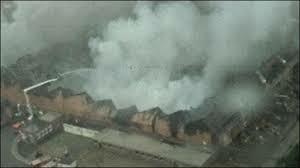 The lung disease, a form of cancer, is almost always caused by exposure to asbestos, and her death has been directly linked to the fire that took place at COD Donnington in 1983. The fire sent an excessive amount of smoke, dust and debris high into the air, with it later raining down over a 15 square mile area. Particularly affected were the gardens of the people living nearby. The extent of the debris was so great that the first victim of mesothelioma linked to the fire, Ellen Paddock, described “seeing snowflakes falling, and playing in them”. Tragically, these “snowflakes” were deposits of asbestos released by the fire. Mrs Paddock died in 2008, aged only 31. Before her death, Mrs Nunn contacted Asbestos Support, telling them of the ash from the fire that had collected in her garden at the time of the fire. A local coroner stated: “For two days there were no warnings that the dust was dangerous and by this time a lot had accumulated over the local area, in particular in Mrs Nunn’s back garden.” Initially, it was denied that the ash contained asbestos, and it remained in the street for almost a week before a clean-up operation began. Although Mrs Nunn’s death was recorded as accidental by her coroner, he pledged to keep the file on COD Donnington open, as it is sadly expected that further similar cases will open in the future. Such incidents like these are far from isolated, however. Indeed, there have been dozens of cases worldwide in which mesothelioma has been linked to asbestos, specifically in ash following fires. Such a high incidence of the disease should simply motivate your organisation all the more to invest in asbestos air testing if asbestos has been disturbed or exposure through damaged asbestos is presumed, of the kind that we can offer here at Trident Surveying. If you are concerned that your school, college or business premises might contain asbestos, please get in touch with Trident Surveying today. We are a UKAS accredited asbestos testing service that can confirm whether asbestos is present in your building via asbestos air testing and other procedures. As easy as it can be to imagine that the need for asbestos awareness training is a thing of the past, new stories are continually emerging that demonstrate its contemporary importance to be greater than ever. One such case is that of a former marine engineer from Wardley, Gateshead, who has won a legal bid for compensation after being diagnosed with the aggressive asbestos-related cancer, mesothelioma. The dad-of-three, Colin Thorn’s diagnosis with the incurable cancer of the lung lining came in December 2013, and follows a long career at the Ministry of Defence, which has admitted responsibility for the 59-year old being exposed to asbestos while he worked. He was subjected to the fibres as he repaired pipework on various vessels and during cleaning procedures on board nuclear submarines during his 1971-1995 spell with the MoD. Thorn described himself and his wife, Deborah, as having been “knocked for six” by the diagnosis, particularly as it had resulted from him simply going to work and doing his job. He said that the breathlessness that he now experienced rendered him unable to work and prevented him from going out as much as he used to. He admitted to being “extremely concerned” about what the future held for him and his wife as his condition worsened. He also expressed extreme anger at not having been given the equipment that would prevented his inhalation of asbestos during his work onboard Royal Navy vessels. He also signified his delight at receiving the settlement from the MoD, stating that he would use it to fund the care that he will require with the deterioration of his condition, and to improve the financial security of his wife. Not only was Thorn not offered any form of breathing mask or respiratory equipment for his work, he told his lawyers, but there were also no measures in place to prevent asbestos dust spreading. Such words will certainly strike a chord with those who might not have previously realised the continued vital role played by asbestos awareness training in today’s organisations. The news of Thorn’s compensation award comes as a nurse has been appointed in the North East to deal specifically with mesothelioma victims. People who have received a diagnosis for the life-threatening respiratory disease in Northumberland and North Tyneside will be able to receive support from Leah Taylor, who will also work with other regional teams to ensure better access to support groups, information and treatments. Hazardous World War II History Lesson! We all know the benefits that a prop may bring to a teacher in a history lesson to aid students with the learning process as they get to physically see and feel the item themselves to get a better understanding of what the teacher is explaining. But when the subject is WWII this could be a potentially hazardous subject to both students and teachers, especially if the item of that period is a WWII Mask. Why would a WWII Gas Mask be dangerous?WWII gas masks are potentially dangerous as they can contain and release asbestos fibres. They can also be contaminated with harmful chemicals from previous use in gas drills. In addition some post war gas masks can release asbestos fibres and can be contaminated.Tests have shown that asbestos fibres can be inhaled by wearing the masks. Asbestos fibres can also be released from handling the masks, filters or carrying bag. So why use asbestos in gas masks?After the widespread use of poison gas in the Great War it was expected that gas would also be a major factor in WWII so civilians as well as military personnel were provided with gas masks. How many gas masks were produced and what types of asbestos were used?It is difficult to put an exact number on how many of these asbestos containing gas masks were manufactured but to put it in perspective one company in Blackburn, Lancashire had a contract from the government in 1936 to make 70 million and production continued throughout the war.There were two main types of asbestos used during the manufacture of these gas masks: Chrysotile (white asbestos) for civilian respirators and Crocidolite (blue asbestos) for those equipping the armed forces. The health risks associated with these masks only came to light post-war when factory workers making the masks started showing abnormally high numbers of deaths from cancer. Why is asbestos dangerous?The Health & Safety Executive website warns: “Breathing in air containing asbestos fibres can lead to asbestos-related diseases, mainly cancers of the lungs and chest lining. Asbestos is only a risk to health if asbestos fibres are released into the air and breathed in. Past exposure to asbestos currently kills around 4,000 people a year in Great Britain. This number is expected to go on rising at least until 2016.There is no cure for asbestos-related diseases. There is usually a long delay between first exposure to asbestos and the onset of disease. This can vary from 15 to 60 years.” What should a school or a collector do if they own one of these Asbestos containing Gas Masks?The local authority should be contacted for advice on how to safely dispose of the masks, filters and the canvas bags. In 2004 the Imperial War Museum had issued the following guidance to their staff:“Most British gas masks of WW2 vintage have asbestos (blue and/or white) as a component in their filters …Where unsure, it should be assumed that the filters do contain asbestos until proven otherwise. The filters may, in any case, contain other respiratory irritants. Thus no gas mask of WW2 vintage should ever be worn.…Note:There is a further health and safety issue with gas masks that have been exposed to chemicals eg used in ‘live’ gas tests and drills. 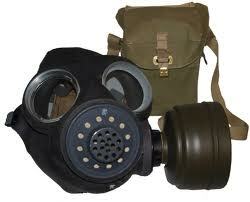 Such gas masks should not be handled and should not go on display. They should be sealed in polyethylene bags (at least two layers) or an airtight inert container. This should be carried out in a fume cupboard, whilst wearing latex or nitrile gloves and a lab coat. The gloves should be disposed of and the lab coat disposed of/laundered after use. The enclosures should be labelled to indicate that they contain materials that are potentially hazardous and should not be opened. Any further enclosures that they are placed into, eg boxes, should be appropriate labelled as described above.